After a discussion on twitter with the lovely Helen I am attempting to revive this blog (again). So you will be subjected to more witterings on and random mind vomit. Sorry, but blame Helen who said she would love to read it all! I won’t subject you to a blow by blow account of my doings since my last post in June, I shall start afresh from now. It is half term – a week too late, we at work are all shattered and with no tolerance levels left at all. I have nothing planned for a week, except a visit to the doctor to demand pain relief that actually works thank you. Oh and my mum wants me to go to York with her. On pay day. She’s buying lunch. See you there!!! 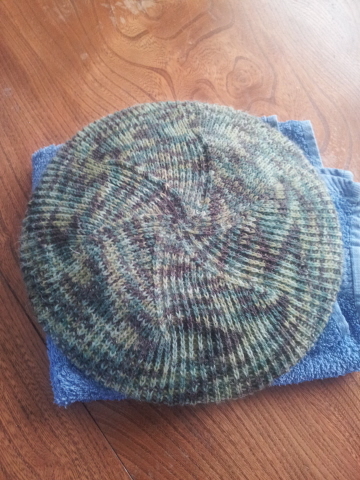 Here’s the obligatory photo – my latest finish: The Fisherman’s Cap from the design by Woolly Wormhead. We have very cold (overnight minus temps) forecast for the weekend so it might even get some wear.